If you're going to snuggle a baby against you, probably go ahead and get your insulin pump out of your bra (who wants to snuggle against hard plastic/metal - no one). 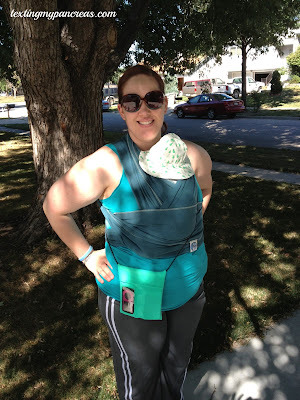 If you're going to take it one step further and snuggle that baby with the use of a wrap, definitely get that insulin pump out of your bra because now you can't bolus without beeps and/or buzzes letting loose right next to their teeny, tiny, sleeping self. Trying to figure out where my basal rates (or really, anything) should be at post-pregnancy is really hard. My body is still healing and readjusting to the baby being outside so simply going back to pre-pregnancy settings on my pump doesn't quite cut it. My CGM graphs are resembling [insert name of well-known roller coaster here]. How does anyone get anything done when there is a baby around? I'm lucky if I get to shower before 3:00 pm now, much less appear (clean, dressed, and coherent) at work on time. I have around 6 weeks left in my maternity leave and I have no idea how to go back to real life, or how to get into pants that don't stretch, or what "well-rested" feels like. It's really, really hard to have to momentarily ignore my daughter's cries because I have to handle a low blood sugar. There's no way for me to communicate to her yet that while I know she needs me and more than anything I want to pick her up and take care of her, for her safety it's not a good idea right then. It upsets me every time it happens. Also really hard? Dealing with a very fussy baby with a blood sugar of 376 at four in the morning without letting myself get cranky about it. And lastly, I'm digging this tote from Tallygear (disclosure: I received this tote for free and while I am not required to write about or mention it, I like it, so I am), as a convenient way to carry my CGM, phone, a tube of GlucoLift and some lipbalm while taking a stroll with the Rabbit. The viewing window in the front of the pouch means I don't need to dig it out each time I want to see my CGM screen - super thoughtful! Getting out into the world - and the fresh air and sunshine - for a little bit each day helps to curb the cabin fever 'round here. I'm impressed that you found the time to type this out! And yup, getting out and about in the fresh air with your kiddo is totally worth the effort. Thanks for sharing the pouch! This would be perfect for my beach honeymoon. I've been wondering what I would use that is still small, not ugly, and could be worn easily while wandering around the resort property. THANK YOU!! I realize this is completely insensitive, but welcome to motherhood. Sounds like you're doing great. I'm sure you will continue to be a great Mom. Despite the momentary issues, I'm really, really happy for you. Oh, and wait 'til the teenage years. You look wonderful and you're doing great! Pregnancy And Type 1 Diabetes.